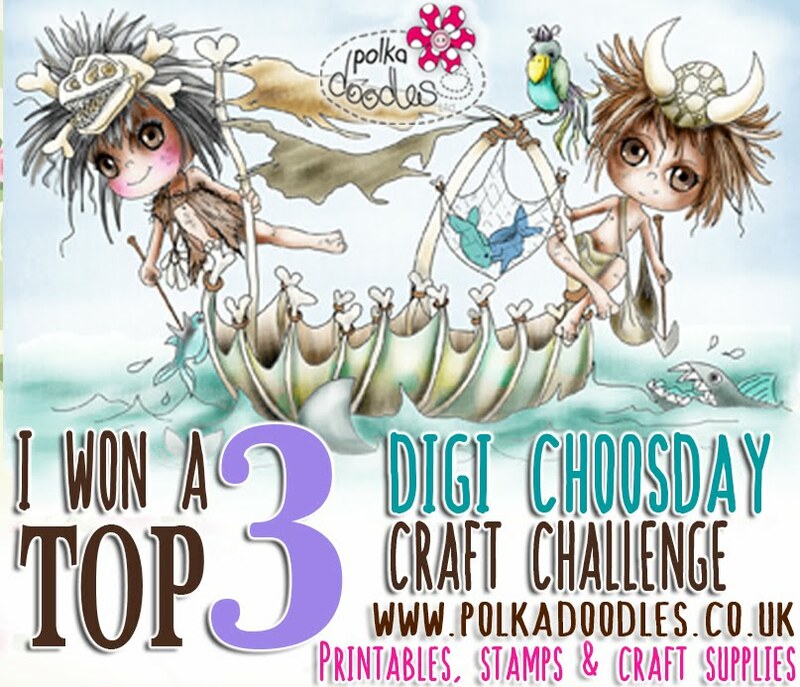 So, we hope you enjoyed the 7th birthday fun the Design Team had over on our Facebook pages for Digi Choosday and Polkadoodles. The team had a lot of fun colouring up the mashed up images and sharing them with you all. If you missed the fun we had then head on over to our Facebook pages HERE and HERE right now to see what we got up to and also if you check the website right HERE you may see some of the mashed up digis on sale now. The weather is getting warmer (here in the UK) and summer could possibly be here at last, so with that in mind we would like to see you make lovely card or a scrapbook layout, a gift or even a piece of home décor that depicts summer to you whether it be flowers, beaches, sunshine, the sea. You can use any products you like to enter as long as it follows the theme for this week. The winner and top 3 for week 19 can be found at the bottom of this post. So let’s see what the design team have made for us…. 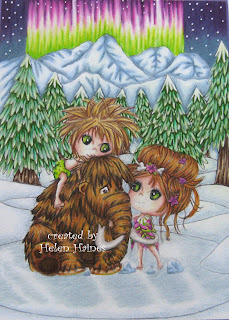 Helen - Can't wait for the summer is it here yet!! Well Seashore Shannon thinks it has you can find her here in the store , she's part of the Pretty Sweet collection. I just love her hair, looking a bit seasidey windswept I think!! Mine looks like that without the weather to help !! 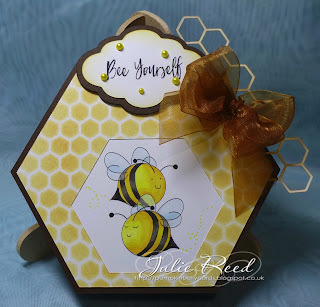 Julie - I am so excited to join the Team here at Digi Choosday and for my first post, 'beeing' as I am so happy I am sharing some happy Bees from the Winnie Fruit Punch Collection. What is more Summery than cute Buzzy Bees? 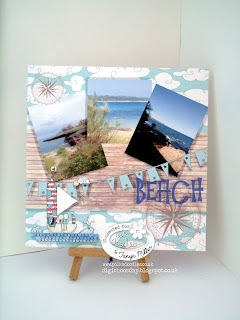 Monica.-Summer is all about sun, beach, ocean, waves, breeze and this what my makes shows. 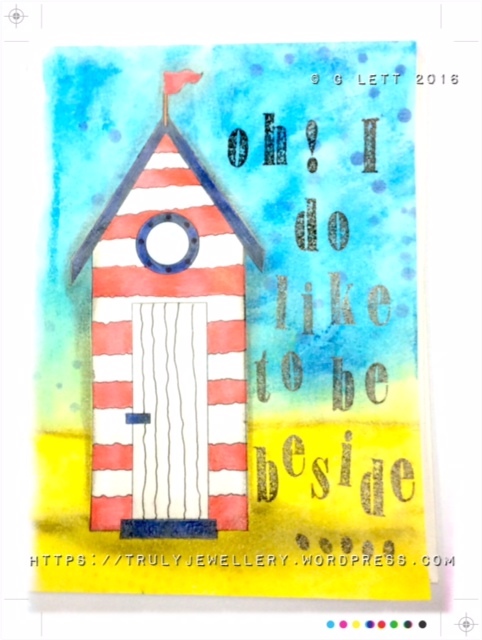 I used precoloured image, papers and sentiment from Work & Play 4 Collection. Audrey used the image Eden Birdcage which can also be found in the Eden Big Kahuna Bundle Download Collection. Image is colored with Copics. Sentiment and badge are from Lavender Tea Download Collection. Papers are from Winnie Sugar Sprinkles Full Download Collection and flowers are from Winnie Fruit Punch Full Download Collection. Additional details can be found on my blog. Anjie - For my make this week I have used one of the colouring pages from the Colour Therapy 2, Inspiring Foliage downloadable colouring book. I've used Sakura Glaze pens to colour it in and it is so shiny, the photo doesn't do it justice at all, it's really hard to capture the glaze. Tanya - For this week's challenge, having just come back from a wonderful holiday I thought I would make a start on my scrapbook album for the second leg of our holiday which was a week's stay in Sa Coma, Majorca and this is the first page I've created using the sky paper, boat and compass from the Little Kingdom Collection together with the wood and the bunting from the lovely sweet Winston Collection and combined it with three photos from our holiday. Hope you like it. Great makes from the DT I’m sure you will agree. We have some great ideas for you this week! Add your entry using the linky tool below. Please email us at sales@polkadoodles.co.uk quoting DCW019001 to claim your prize of £5 worth of downloads from the digi store! Grab your Badge from the top of the page to display on your blog. Well done Feathery friends! You have all been added to the Feathery league board - so now you can put a Feather in Your Cap and use our Feather badge on your blogs! 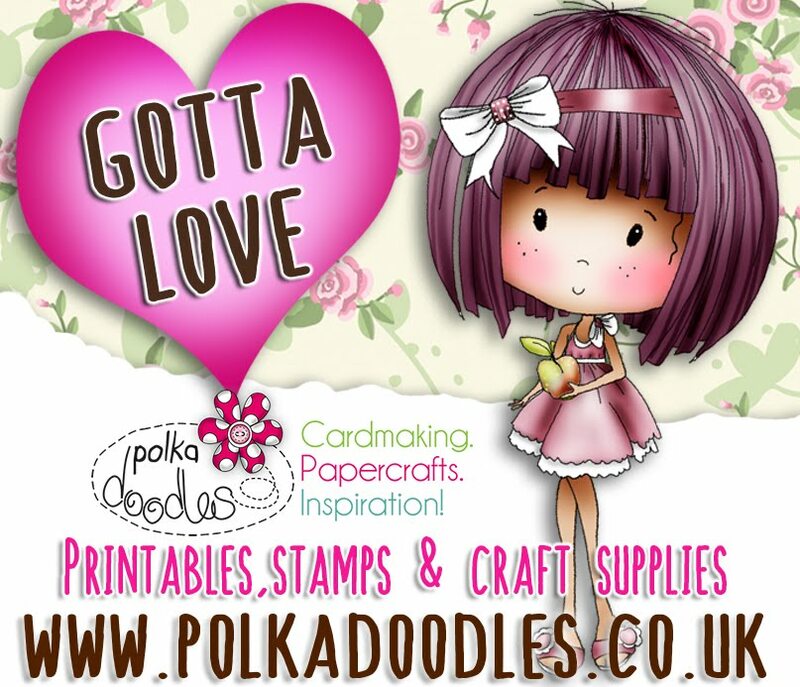 As Polkadoodles is celebrating our 7th birthday then during May we will have lots of uber great discount codes and offers lined up for you so make sure you sign up for the newsletter on the website and join our Facebook group to make sure you don’t miss any of the fantastic offers! 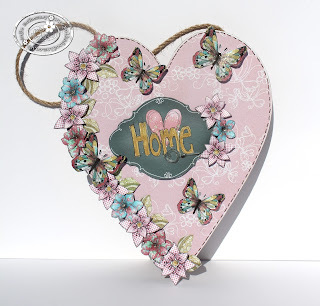 She has used a mixture of fab elements from The Work & Play 9 Love & Kisses collection (wedding cake), pre-coloured balloons, butterflies, tag and sentiment from the Cherry Blossom Lane Collection and the birthday candles from the Winnie Fruit Punch Collection. What an awesome make. Please email us at sales@polkadoodles.co.uk quoting DCW018001 to claim your prize of £5 worth of downloads from the digi store! Grab your Badge from the top of the page to display on your blog. We will be back next week with another fabulous new challenge for you!! We are celebrating our 7th Birthday here at Polkadoodles during May and we have lots of uber great discount codes and offers lined up for you so make sure you sign up for the newsletter on the website and join our Facebook group to make sure you don't miss any of the fantastic offers! You can use any products you like to enter as long as it follows the theme for this week. PRIZES: Random winner (chosen by Random.org) will receive £5 worth of downloads of your choice from the digi store! The winner and top 3 for week 17 can be found at the bottom of this post. 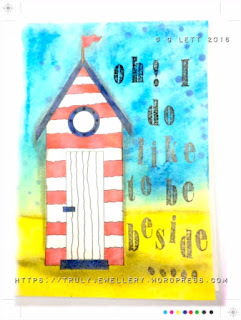 Anjie - I have used the bird house digi from the fab Winnie Fruit Punch download collection. I printed it out a few times to decoupage bits of it. I coloured it with my Kuretake Gansai Tambi watercolour paints. 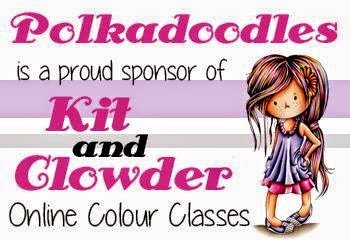 There paints are working so well with all our Polkadoodles products, and are great for new colourers to use and it doesn't matter if it's not perfect. Audrey - This week I made a banner, a great way to celebrate any achievement (in my opinion at least:)) I chose this sweet image called One For You and it comes with the frame around it as part of the Winnie Fruit Punch Big Bundle Download. The sentiment I created features 2 of the sentiments found in the Winnie Fruit Punch Big Bundle Download that I combined in GIMP and cut with my Cameo. 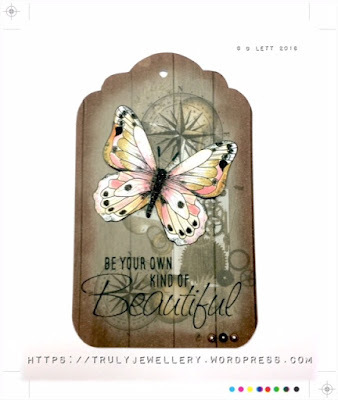 These beautiful papers can be found in Work and Play Volume 12 Big Kahuna Download. To find out how I colored my image and did the background, please come visit my blog. Hugs!! 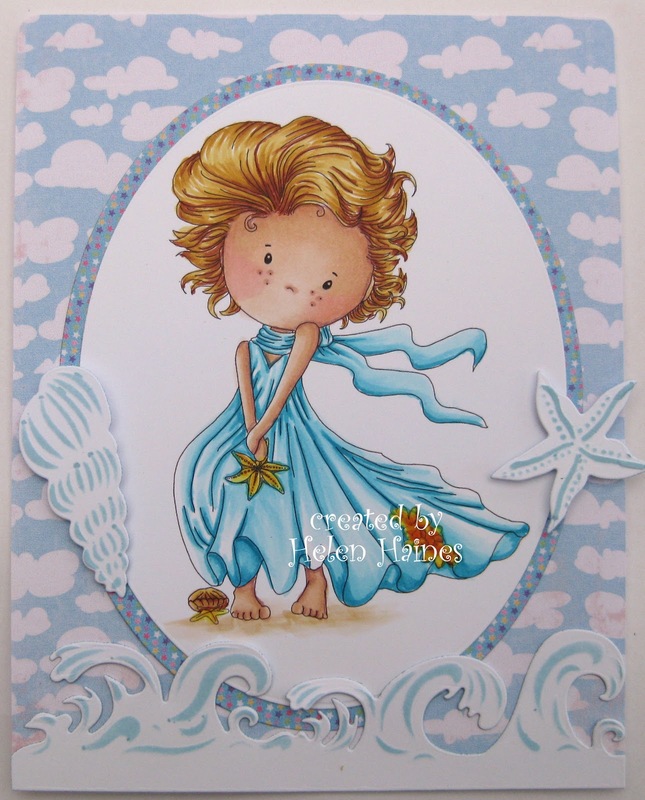 Monica.-For this birthday celebrations, I made a shell shaped card to create an scene for the beautiful mermaid digi taken from Bonbon Belles Collection. 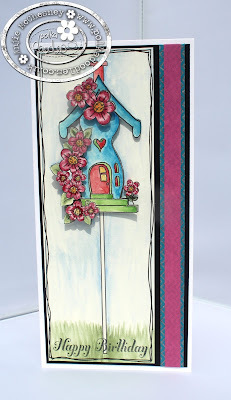 The colorful papers I used, as well as the sentiment, are from Dollie Daydream Goes East Collection. Such lovely inspiration from the team this week! 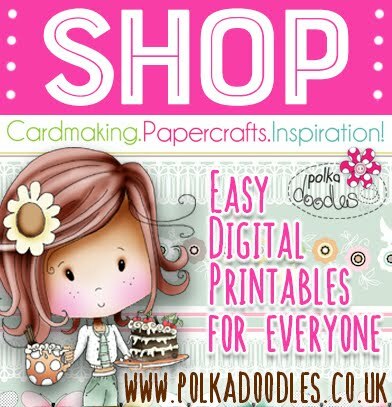 Please email us at sales@polkadoodles.co.uk quoting DCW017001 to claim your prize of £5 worth of downloads from the digi store! Grab your Badge from the top of the page to display on your blog. Well done ladies, we all loved your makes! Don't forget your Top 3 badge! Well done ! You have been added to the Feathery league board - so now you can put a Feather in Your Cap and use our Feather badge on your blogs! PRIZES: Random winner (chosen by Random.org) will receive £5 worth of downloads of your choice from the digi store! The winner and top 3 for week 16 can be found at the bottom of this post. 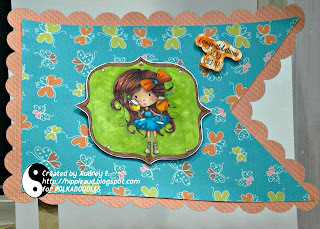 Monica,-My make for this week is a rocker card with two upload wreaths, one is made of leaves and the other one is made of flowers. Everthing in this make is from Winnie Sugar Fruit Punch: wreaths, papers, butterflies, sentiment and precoloured digi (you can find it also in b/w). Anjie - I've used the new Little Kingdom CD. I've glued a background paper onto the heart, distressed it a little bit and added a stitch line around the edges. I've then printed the home word art and mounted it on 3D foam. Then I sat and cut lots and lots of flowers out, layered them up with some leaves and glued around the edge. Finally I cut some butterflies out, shaped them and glued them in place. 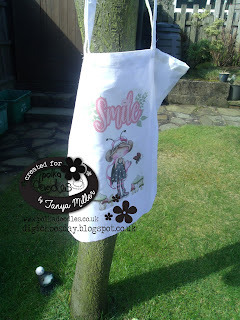 More info and pics on my blog. 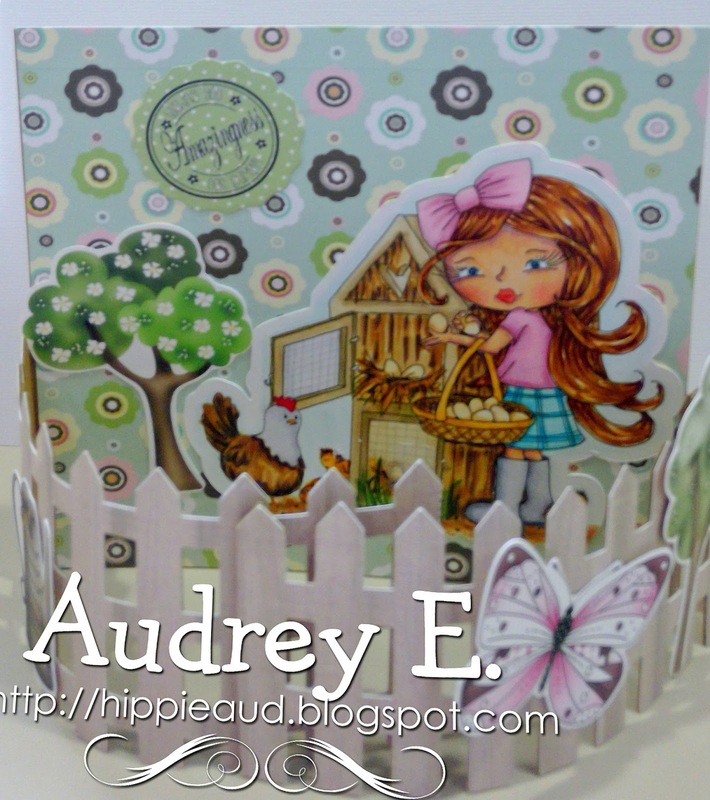 Audrey made a bendy fold card for my anything but square creation. I used the image Egg Collecting, which can be purchased as a single image and also can be found in Work and Play 10 Country Life Full Download Collection. My sentiment and the paper I used for the fence also come from this collection. 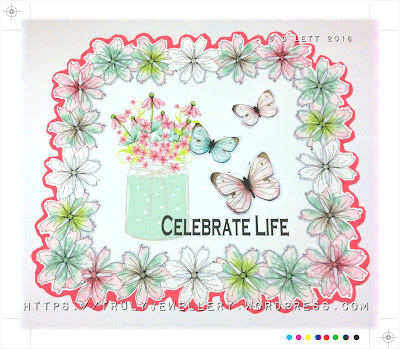 The green polka dot paper as well as all the embellies I used are from Winnie Fruit Punch Full Collection and the flower paper can be found in Winnie Sugar Sprinkles Download Bundle. 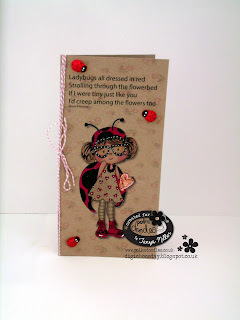 Additional details regarding my card can be found on my blog. Gail - For this weeks challenge I choose to make a tag with the fabulous new release Little Kingdom. Everything on the tag is from the CD-ROM and even the tag itself is from the same collection. 25 - Chrissy well done! Please email us at sales@polkadoodles.co.uk quoting DCW016001 to claim your prize of £5 worth of downloads from the digi store! Grab your Badge from the top of the page to display on your blog. We would like to see anything that includes kraft card but you can also show us a creation which uses a die-cut too if that makes it easier!. 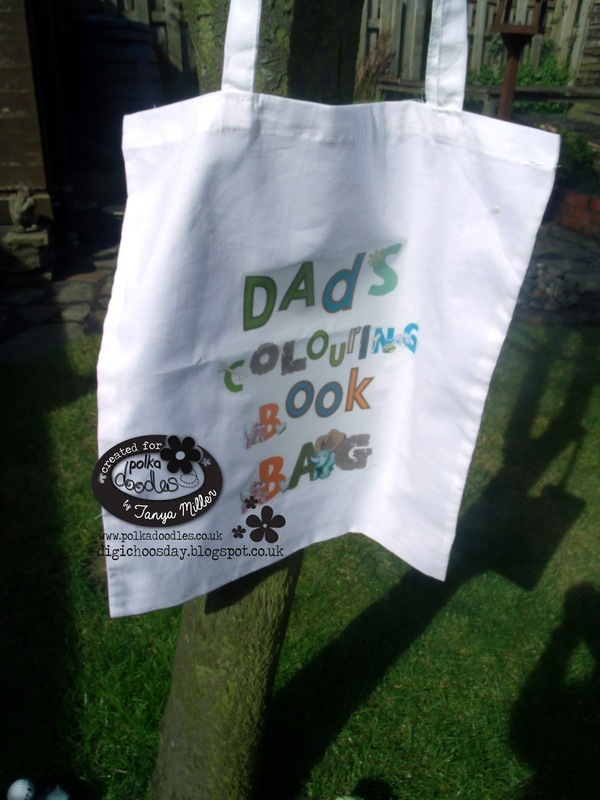 You can use any products you like to enter as long as it follows the theme for this week. The winner and top 3 for week 15 can be found at the bottom of this post. 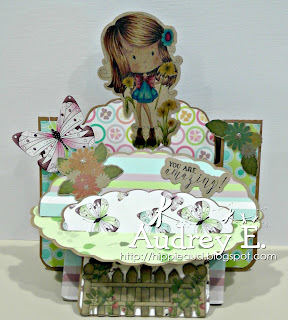 Anjie - For my make this week I have used the Smile image from the adorable Sticks and Bones collection. You can get the image HERE on her own, or you can get the full collection HERE. I'm going to show you how to extend a border die to fit your piece of card, so pop over to my blog to see how to do it and create this whole card. Monica- For this challenge I had try for the first time colouring on kraft card. I really enjoyed it. As Anjie, I also used Stick & Bones collection. I printed some embellies and topper over kraft card. Then used one of the border cutting files included and cut it over regular cardstock to make some contrast. Printed the sentiment over white cardstock to make it pop up. And finally my personal challenge, colouring the adorable b/w digi over kraft card. 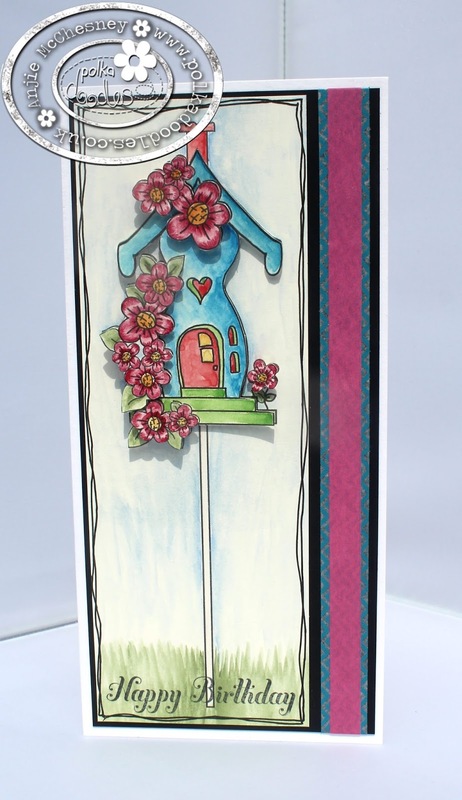 Tanya - This week I've taken on the challenge for first time colouring on kraft card just like Monica above me. 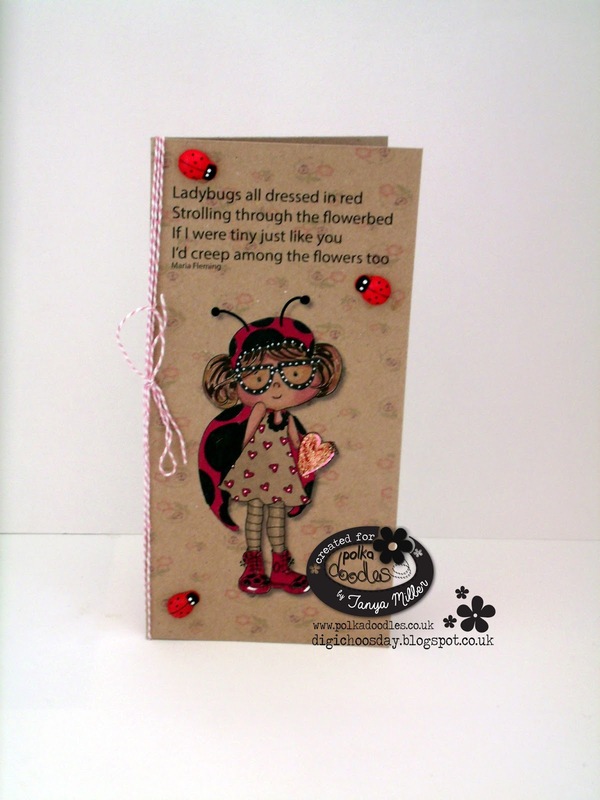 I've used the lovely Lily Bug Love collection - papers and sentiment and digi from the download HERE but you can also get it on CD as well and the digi image on its own in black and white for you to colour yourself is called Lily Bug Love Hello available HERE. More details on my blog. Audrey - This time I chose image Dandelion Days which can be purchased as a single image or as part of Winnie Fruit Punch Big Bundle Download. 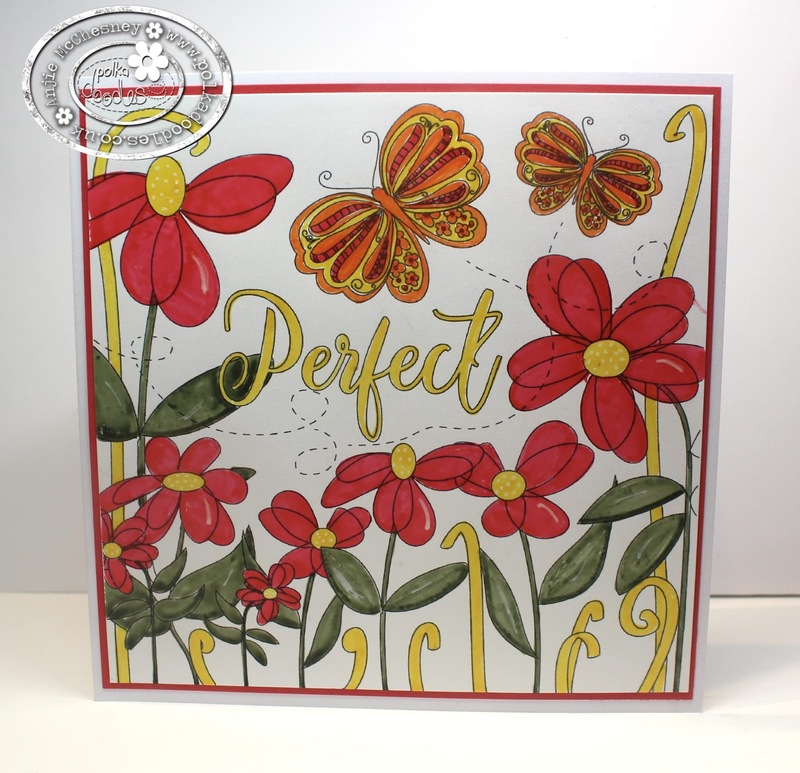 I also chose all my other items for this card - embellies, papers and sentiment - from the Winnie Fruit Punch Big Bundle Download. I had fun coloring on Kraft paper as well as using it for my card base and the base of most of my embellies and sentiment. Please visit my blog for additional details. Hope you like it! Great makes from the DT I’m sure you will agree, we have some great ideas for you this week! The winner chosen at random by www.random.org is: # 11 Janice, well done! 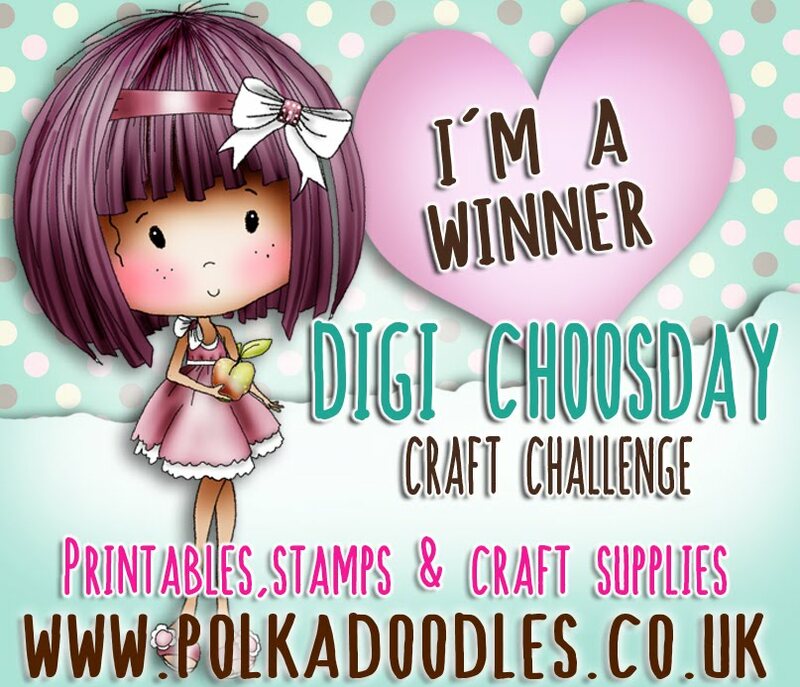 Please email us at sales@polkadoodles.co.uk quoting DCW015001 to claim your prize of £5 worth of downloads from the digi store! Grab your Badge from the top of the page to display on your blog.